Mamas, you have enough to worry about when it comes to holiday meals, TRUST ME!!! MamaBreak is bringing you EASY ways to make delicious dishes this holiday season, so you have more time to do important things-- like hugging those babies!!! This is one of my favorite and one of the easiest recipes there are! Promise! 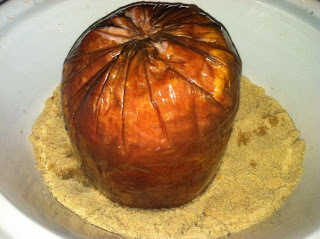 You need 2 ingredients: a ham and brown sugar. Yes, that is IT! You can also easily add honey (1/4 cup-- spread on the ham) or pineapple ( 1 can, just dump it in), but this is the quick and easy recipe. It looks fancy and like you slaved for hours, but you are only going to spend 5 minutes prepping and you are going to let the slow cooker do the rest! 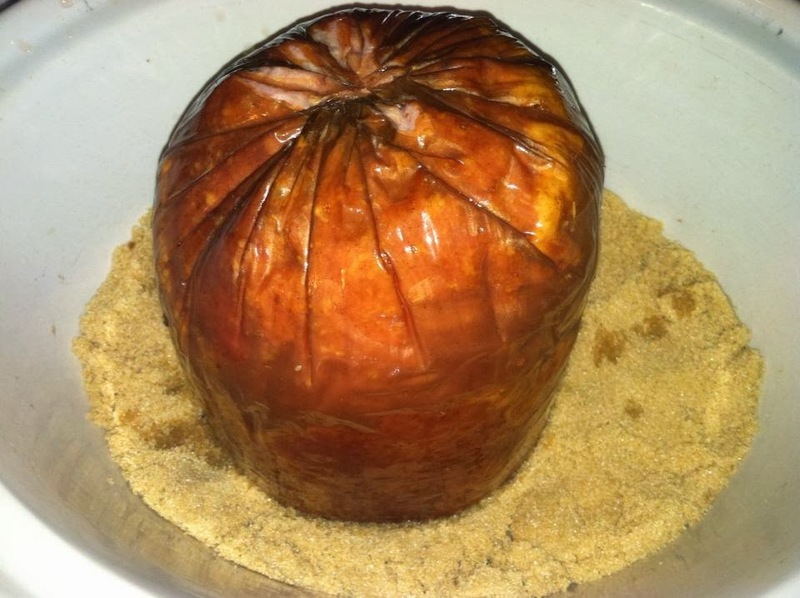 Take 2 cups of brown sugar and dump it into the bottom of the slow cooker. If you have a larger slow cooker and/ or a larger ham, you will want to add a little more. I cooked a 3-4 pound ham (which feeds my family of 5-6 perfectly) for this recipe. Just make sure there is about 1/4- 1/2 inches of brown sugar resting on the bottom. It will not look like a lot, but the juices from your ham are going to liquify it making it DELICIOUS! Then add your ham with the flat part down. You may need to trip your ham in order to get everything to fit. 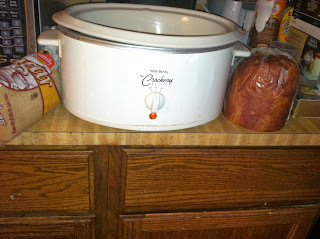 I like to use my pressure cooker or rice cooker on the slow cooker settings for a larger ham because it is taller. For this small ham, my smaller slow cooker worked just fine. Cook on low for 5-6 hours. I usually make this at noon and let is cook until dinner time. And that is it. You are just letting the slow cooker do the work for you (the back piece is an example of what will happen if you slice a piece off and leave it without the ham-- we take these darker pieces and cut them up for a soup later in the week). Take out of the crock pot, slice, and SERVE!!!! Beautiful ham with VERY LITTLE work and it is juicy and DELICIOUS!!! Oh my goodness, this sounds absolutely amazing and it being s easy with only two ingredients makes it a win for all Momma's on the go! This looks really good! I am a huge fan of the slow cooker. 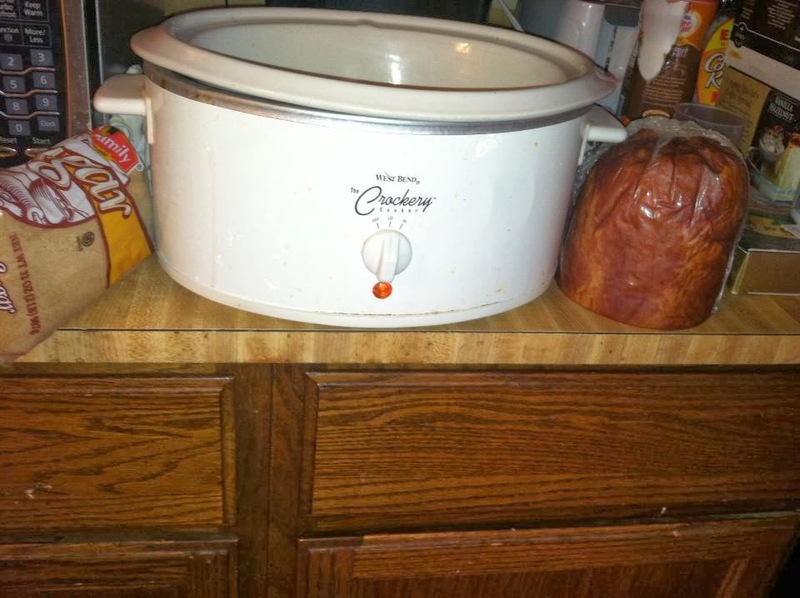 I have cooked lots of things in my crock pot, but never a ham. I can't believe I never thought to. I pinned this so I can try it later. This looks very tasty. Thanks for sharing!